In cryptography, a client certificate is a type of digital certificate that is used by client systems to make authenticated requests to a remote server. A client certificate identifies the client just like the server certificate identifies the server. 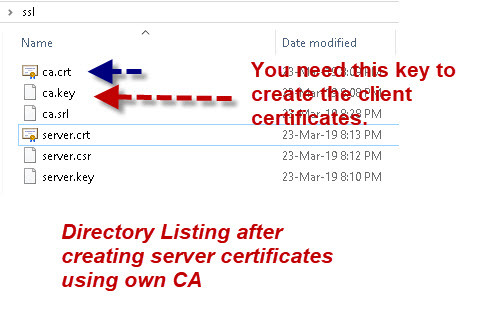 Normally certificates are created and distributed to each client that connects to the server/broker that requires them. However you can share a client certificate between clients. As with username and password authentication the broker dictates whether or not a clients need to supply a certificate. You can use certificates in combination with username and password authentication. The client and server must use the same CA for the client and server certificates. You create the client certificates using the same process as you used for creating a server certificate. Create a client key don’t password protect. Create a client certificate request using the key. 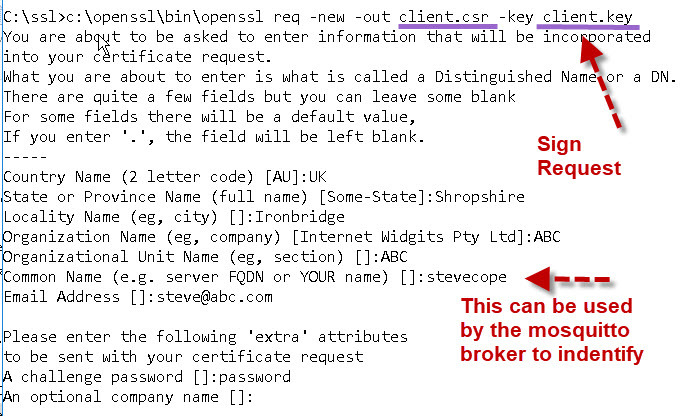 Use the CA key to sign the client certificate request from step 2. You need an existing CA certificate and private key which you get when you follow the steps for creating your own self signed server certificate. 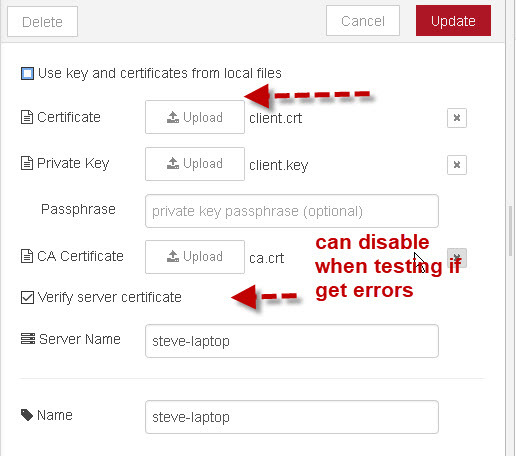 You need to use the same CA for the client certificates as the server certificate, and the broker needs to use SSL. This is because client certificates require an encrypted connection. Note: it is OK to create a password protected key for the CA. The first step is to create a client private key. Next create a certificate request and use the client private key to sign it. You will be presented with a form that you need to complete. The most important entry is the common name. This name can be used by the broker to indentify the client in place of a username. 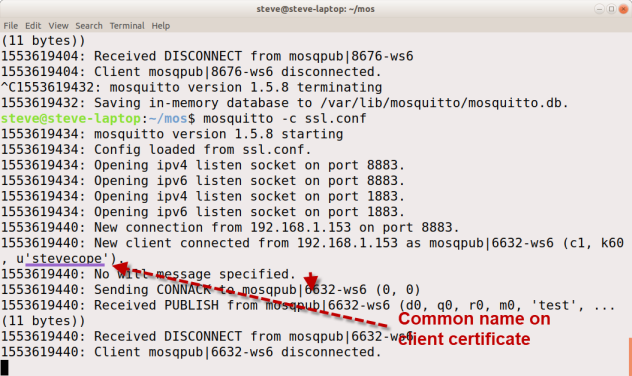 mosquitto_pub --cafile C:\ssl\ca.crt --cert C:\ssl\client.crt --key C:\ssl\client.key -d -h 192.168.1.157 -p 8883 -t test -m "hello there"
Note: You need to use the server name that is on the server certificate. If I use the IP address instead I get this error. 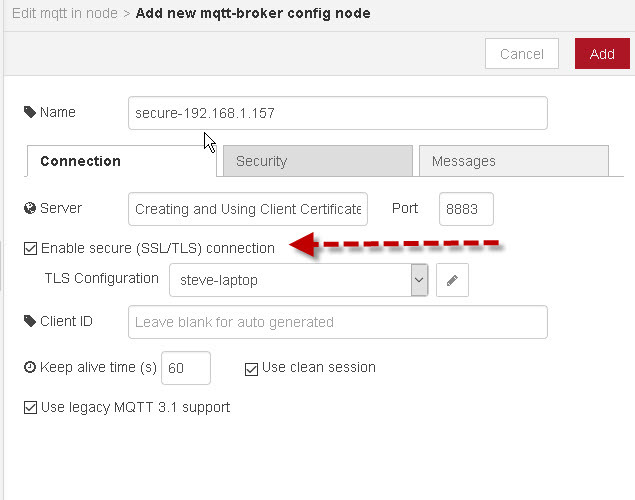 On Node red you need to enable the SSL/TLS option in the broker settings.